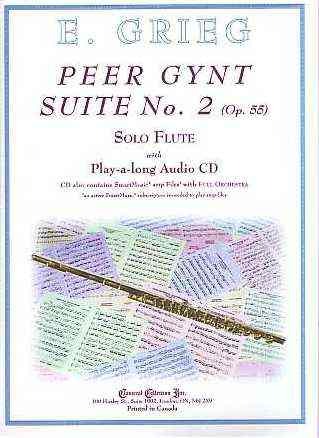 Peer Gynt Suite No. 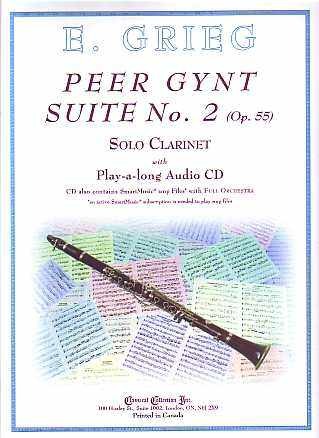 2 is presented as a Solo for Flute, Clarinet or Alto Saxophone with a play-a-long Audio CD which also contains SmartMusic SMP Files. Edvard Grieg, pianist and composer, was born on June 15, 1843 in Bergen, Norway and died on September 4, 1907 in Bergen, Norway. He is the most important Norwegian composer of the Romantic Period in Music (1825-1900). His works include: Piano Concerto in A Minor (Op. 16, 1868), Holberg Suite for Orchestra (Op. 40, 1885), Lyric Suite for Orchestra (Op. 54, 1904), several works for solo piano and a large number of songs with piano accompaniment. 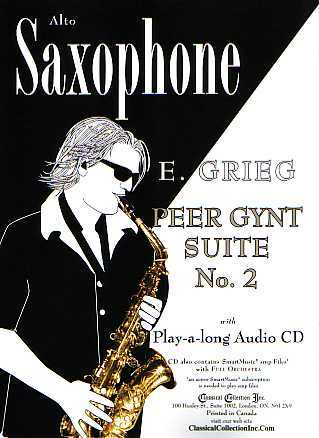 In January 1874 Henrik Ibsen (1828-1906), whom Grieg first met in 1865, requested that Grieg compose incidental music for his five act play Peer Gynt (1867). Incidental Music for Peer Gynt (Op. 23) was completed in September 1875 and first performed with the play on February 24, 1876. Originally there was a 5th movement The Dance Of The Mountain King’s Daughter (No. 6 in Act 2) but Grieg withdrew it. In order to maintain “friendly” key signatures, the 3rd and 4th Movements of Peer Gynt Suite No. 2 have been transposed up a semitone from the original. The Clarinet Book CD contains Audio and SmartMusic versions for both Bb Clarinet and Clarinet in A. There is also a Piano Accompaniment book available for Clarinet in A.